It’s been a while since I tackled a Daring Bakers Challenge. This month’s Daring Bakers Challenge was Quick Breads and I got it done just in time before the month ends. The Daring Bakers’ February 2012 host was – Lis! Lisa stepped in last minute and challenged us to create a quick bread we could call our own. She supplied us with a base recipe and shared some recipes she loves from various websites and encouraged us to build upon them and create new flavor profiles. 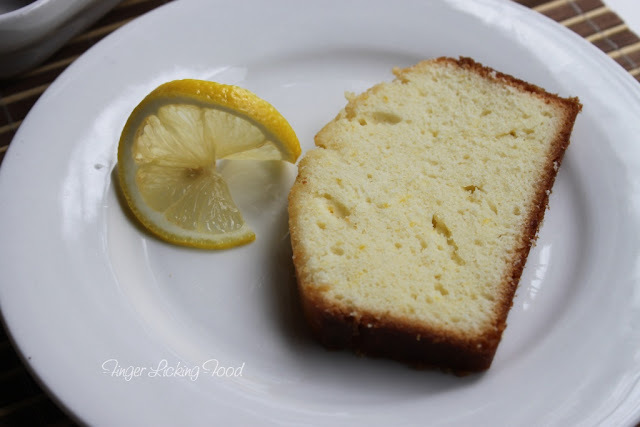 Lisa provided us with some simple delicious base recipes to begin with but one glance at the Meyer Lemon Loaf recipe and I was sold. 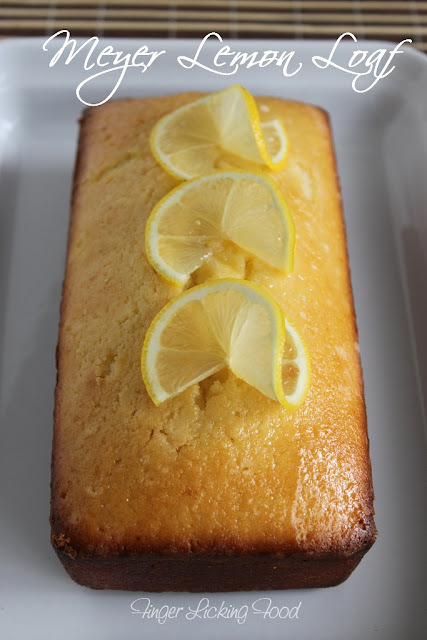 I’ve always wanted to make a Lemon loaf and quickly seized the opportunity. I know Lisa wanted us to build on these recipes but I couldn’t resist trying the original recipe first. Other variations and versions of quick breads, I’ve best left for another day. 1. Preheat oven to moderate 350°F/180°C/gas mark 4. Butter and flour two 8” x 5” (20 x 13 cm) loaf pans. 2. Sift together flour and baking powder; set aside. 3. Place sugar, lemon zest, and eggs into a large mixing bowl and beat with a whisk until the mixture is a light lemon color and thickened a bit. This can also be done with a mixer. Whisk in sour cream, then salt, then rum (if using) and lemon juice. 4. Gently whisk in the flour in four parts, then whisk in the butter in three parts. 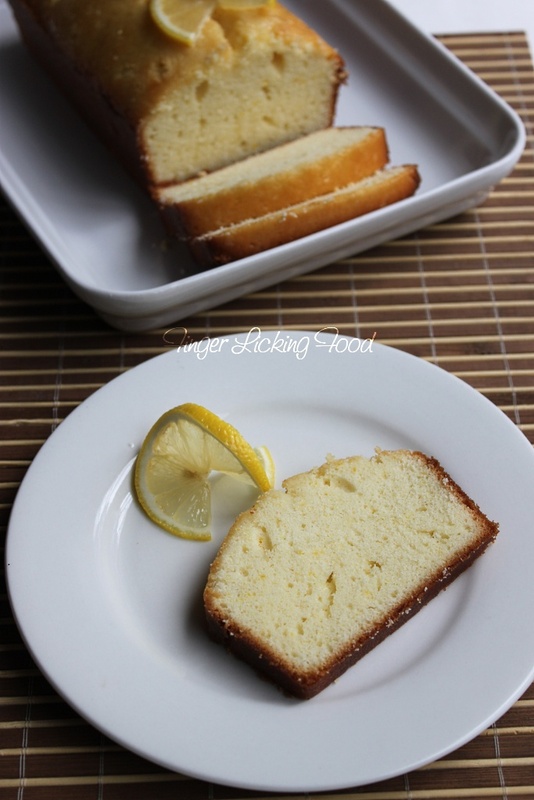 You’ll have a thick, pourable batter flecked with lemon zest. 5. Pour the batter into the prepared pans and bake for 50 to 55 minutes, or until cake tester inserted in center comes out clean. 6. While the loaves are baking, prepare simple syrup. Heat together sugar and water and stir until sugar is dissolved - do not boil. Remove from heat and add the lemon juice. 7. 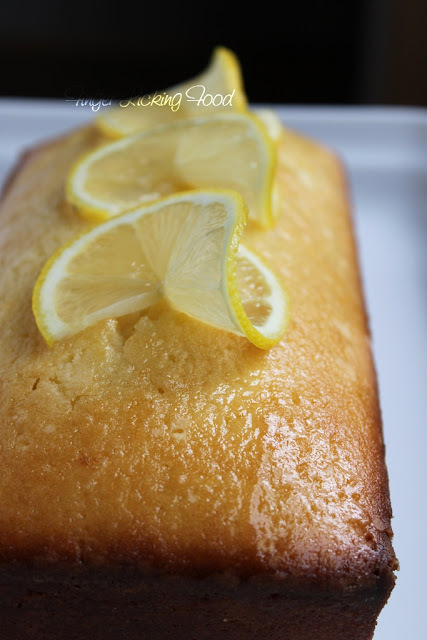 Turn the loaves out of their pans onto a cooling rack and brush liberally with the lemon syrup, repeat brushing as you feel necessary. Let cool. The loaves soak up the syrup beautifully and create a nice glaze on top. Quick breads can have a huge crack on top of the loaf, which is normal. I dressed up my loaf with thinly sliced lemon twists to conceal the crack. Another way is to dust powdered sugar on top. Loaves can be kept wrapped tightly on the counter or in the fridge for approximately 5 to 7 days. Loaves last for 6 months if wrapped tightly and kept air tight in the freezer. I loved the flavor and texture of this loaf. The brushed syrup made the loaf super moist and needless to say delicious. The heady aroma of lemons is quite intoxicating and will certainly make you grab a second slice. Its also a perfect balance of sweet and tart. Thanks Lisa for a quick and easy challenge! 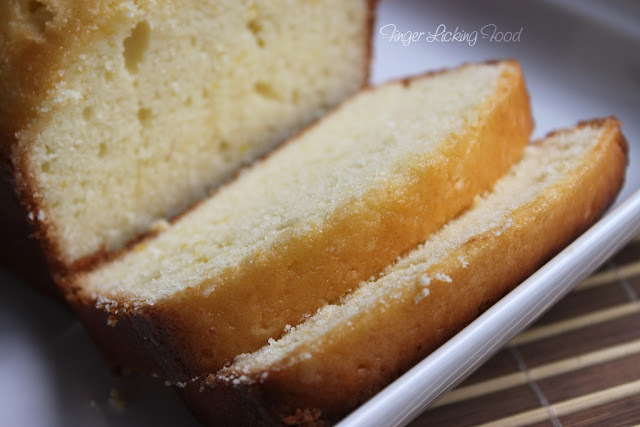 wow d loaf luks divine...!!!! Thats such a flavourful and delicious loaf. Looks like your loaf turned out perfectly! Your loaf is so gorgeous! Great job photographing it. Soooo delicious! I love the lemon-flavour of your loaf! great job done. i am new to baking so should learn and enter this challenge. OMG.. Mouth watering here.. Looks absolutely perfect and tempting dear.. Awesome shots too! !